WarLigth is a casual turn-based online board game where you compete to rule the world. Read more details for WarLight. WarLight is a strategic game, fully inspired by the most popular board game called Risk. Your primary and only mission is to dominate the whole world by occupying every enemy or neutral territory on the map. WarLight is played in the following 3 steps: Deploying a new army, then choosing either to attack or move your army and the last step is confirmation. The Game Command and Defend has some flags on the main menu how many flags are there? when you press New Game on shattered Colony you get a clear picture of the zombies in the background but how many have Blonde Hair? Day Traders Of The Dead is another classic zombie shootem up game when you start a new game you come to a screen to save your profile what is the Number of the Bank note around the saved profile area? Storm Winds is possible one the oldest games on PLayTDG when you start and new game play the ocean guard level. when you can look thought turrets to buys how much is the Health Buffer? You on need the first digit. Ageless War is a game that is made by my good friend rob but on the loading screen how many building can be seen in the background? Wizard defense mixture of shooter and tower defense but what is the first letter of the basic earth spell you get when you start a new game. What is the last number of the pokemon tower defense rating? 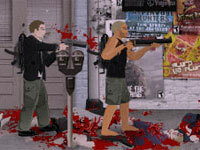 Scavenge, shoot and survive your way through Union City in this sprawling zombie action RPG. Play in Survivor mode for a more realistic experience where the need food and sleep will be added to your survival requirements. Or play in Run’n'Gun mode and blast your way to freedom. Have fun during the weekend! Demonrift TD is a unique mix between Tower Defense style and unique turn base strategy game. Read more details for Demonrift TD. Defend the kingdom of Emaeron from demonic surge all over the country! Try this unique mix between Tower Defense and unique turn base strategy game. King Imkael has fallen. The beloved king was killed in a gruesome battle, defending the last free city in the kingdom of Emaeron. Nothing could foresee this hellish invasion. In Demonrift TD you are taking the role as Baroness Milena, commanding last stand of empire troops against the mysterious surge of demon armies throughout the empire vast cities. Factory Balls 4 is the forth part of the famous workshop where you need to paint some balls. Read more details and watch the full video walkthrough for Factory Balls 4. The factory business is back again! More shapes, colors and balls for painting than ever! Can you produce the ball on the box in each level? Drag and drop a ball over the tools or just click the tools. Watch Factory Balls 4 full video (all levels) walkthrough.